With the weather of late we are seeing strange occurrences in the garden. For perhaps the first time in many years we have an odd assortment of mushrooms appearing everywhere. It seems that every flower pot and crevice has sprouted a different and interesting specimen with some tiny, others in large clusters, some wrinkled, others silky smooth, and all with interesting texture and color. We are rarely treated to their presence since they require cooler weather and moisture to complete their life cycle. 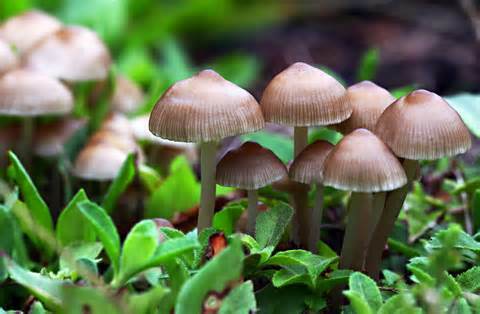 Mushrooms are a family of fleshy fungi with over 425 types found in the United States and Europe. The important part of a mushroom is beneath the soil with the form we see above ground for reproduction. In a vast over simplification, the interesting ‘top’ seen above ground contains spores, which are tiny single cell reproductive genes that are shot into the air to be transported by wind away from the parent. Along its travels this cell will join with another and thus mushroom is born. Scientists estimate that one mushroom may release as many as a trillion single-celled spores. All descriptive books on mushrooms contain photos and a side panel illustrated with a plate that has either a fork or a large red X, indicating whether the mushroom may or may not be eaten. I recommend that edible consumption be limited to those that are commercially grown. The mushrooms in the yard are simply fascinating to observe… and it’s fun to kick one to release the puff of spores! With the heat last week the grasshoppers arrived, appearing in the garden as miniature infants. In a week they have become adolescent eating machines that may be heard plopping in tandem on select garden guests. In a matter of days, they decimated the foliage on the comfrey and rose bushes! After fall mating females deposit clusters of eggs in the soil in a protective "pod". The pod is formed by soil and a glue-like secretion and may contain up to 150 eggs. The eggs over winter in the soil and hatch as nymphs throughout April, May and June as soil temperatures rise and spring rains begin. Nymphs feed and grow for 35 to 50 days, molting five or six times during this period. Development proceeds most rapidly when the weather is warm and not too wet, with rain slowing them down a bit. The Father’s Day storms took them by surprise drowning and washing many away… and quite possibly saving the roses!